+What type of denture materials are used to make denture teeth? Denture teeth and gums are made up of an acrylic plastic resin. 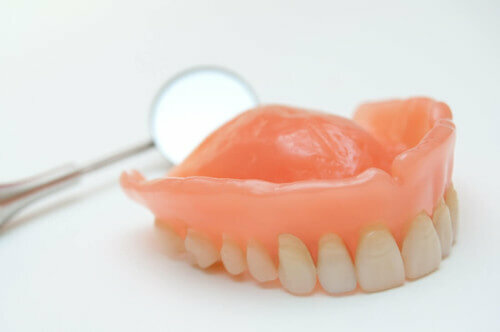 The high strength and resiliency of today’s plastics allow for dentures to made to look very much like natural teeth. +What metals are used in cast partial denture fabrication? 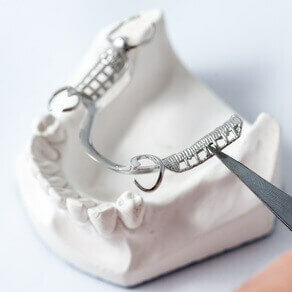 The cast metal partial frames used in dentures are made of 65% cobalt and 30% chromium. There is also 5% molybdemum and other substances. These materials are used because of their high resistance to corrosion, a useful and necessary trait for an appliance that is always in contact with saliva. These materials are also highly thermal resistant, meaning that they don’t conduct heat or cold well, another useful trait when eating hot or cold food and drink. +Why do some people have porcelain denture teeth? Porcelain denture teeth were very popular 20+ years ago when acrylic materials didn’t have the same aesthetic qualities that they have today. Through the years, as technological advances helped develop acrylic teeth that appeared more life-like, porcelain teeth became less frequently used, to the point that they’re now hardly used at all. Porcelain teeth also made a clicking sound when they came in contact with one another while chewing, so the less noisy sounds of acrylic teeth helped seal the fate of porcelain as an older, outdated material for denture construction. +What standards are used in the denture materials used by Saberton Denture & Implant? Any step of the denture-making process that can be done in our own in-house labs is done using materials purchased exclusively from Henry Schein Canada, an ISO certified, and publicly traded company. Henry Schein is ranked as one of Forbes’ best employers, Fortune’s most admired companies in the world and one of the world’s most ethical companies. 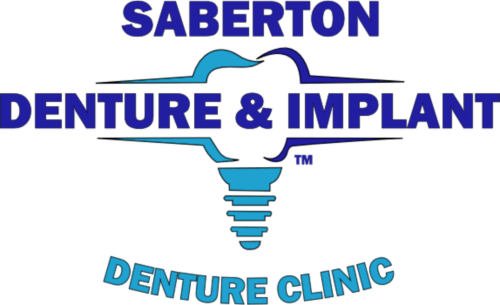 By purchasing all of our equipment and supplies through such a reputable source, Saberton Denture & Implant is able to focus on continuing being a leader in patient satisfaction while knowing that our products and equipment are held to the highest safety and quality standards in the industry. 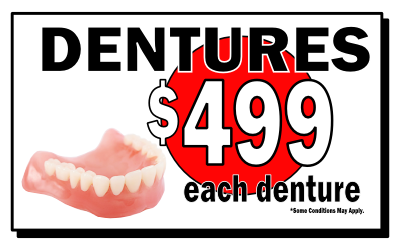 All Saberton Denture & Implant dentures are Health Canada certified or approved. +What standards are used in the denture materials used by the labs that are partnered with Saberton Denture & Implant? Because Saberton Denture & Implant has taken on the task of satisfying thousands of denture wearers every year, we also find it necessary to work in close collaboration with numerous dental laboratories. 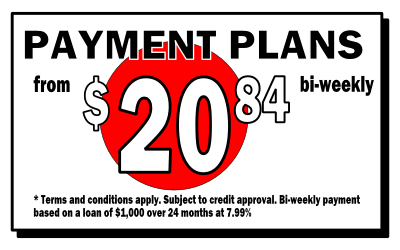 We hold these labs to the same high standards that we demand of ourselves, namely that all dentures are Health Canada certified or approved, and that the final denture products that we produce are all affordable, safe, and well made.